The Eastern Cape has a knack for producing talented chefs and one very promising student is busy preparing for an international competition known as the Young Chef Olympiad. Bethmaree Bezuidenhoudt, 23, of Graaff-Reinet, is one of more than 50 student chefs from around the world who will compete in the olympiad in four cities in India from January 28 to February 2. The former Hoër Volkskool pupil is studying towards a diploma in culinary arts at the South African Academy of Culinary Arts (Saaca) in Fernglen – a foundation that has prepared her well for the competition. It helps that Bethmaree was born into the hospitality industry: her family own a holiday resort and functions venue in the Karoo town. “Right now I am between the academy and The Pastryworks in PE, and our kitchen in Graaff-Reinet, where I’ve been preparing for the competition,” she said. “I haven’t practised any dishes yet but am still in the research stage, deciding what I will make and how I will present it. It is the second time Saaca has been invited by the organisers of the Young Chef Olympiad to send one student to the competition. Bethmaree was chosen by her classmates and her lecturer, Saaca co-founder Ralph Gottschalk. 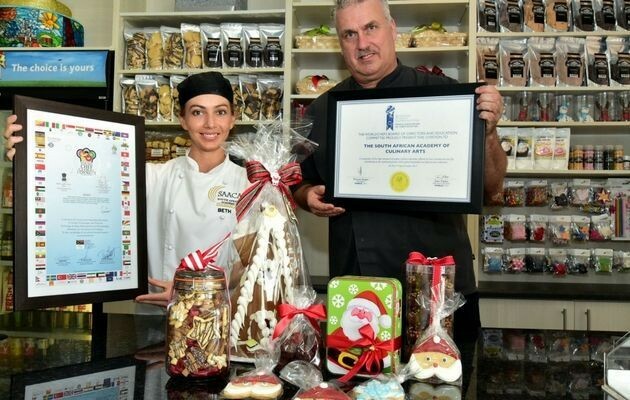 Ralph and his wife, Cherilyn, established Saaca in 2012, and they also own The Pastryworks, where staff and students have been loading the shelves with beautifully made Christmas goodies such as gingerbread houses and traditional German lebkuchen these past few weeks. “At The Pastryworks we make everything from scratch. We do not have any convenience products in our bakery – not one,” Ralph said, adding that his student chefs learnt how to make everything by hand, including classic pastries. The academy attracts students from around the country and Africa, with many going on to find placements in top establishments overseas thanks to Ralph’s international reputation and large network of contacts. Saaca’s courses are acknowledged by WACS, the World Association of Chefs’ Societies, and are accredited by the Confederation of Tourism and Hospitality in the UK. The academy is also accredited by Ithsa, the Chartered Institute of Tourism and Hospitality Southern Africa. Saaca is hosting open evenings for prospective students this Tuesday and again on December 9, both at 6.30pm, at its premises at 13 Mayfair Avenue, Fernglen. Bookings are on (041)363-3377.